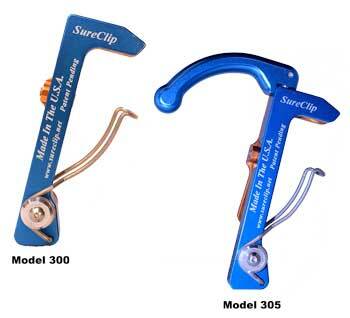 Introducing SureClip’s big brother, not only do we hold the conventional carabiners with our Series 300. 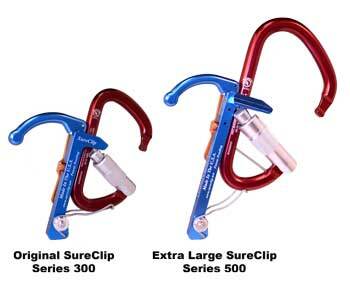 Now our Series 500 can hold the Extra Large or Ladder Carabiners. 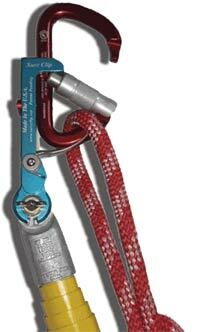 We have also added a hook to allow the rescuer to position a harness, rope, block & tackle or any other device in order to aid in the rescue. The 300 Series — Will accept all of the standard size carabiners listed in our site including oval, D-style, triangle and side gate opening. 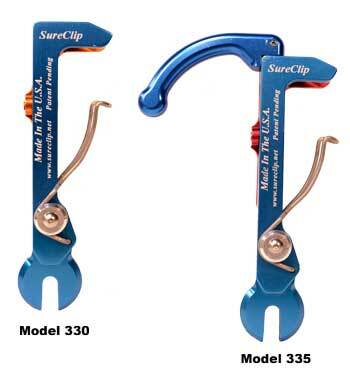 Check out our carabiners page for recommended auto locking carabiners to be used with the Original SureClip. The 300 series comes with four options for attaching the SureClip to a variety of telescoping poles. The 500 Series - Will accept all of the Extra Large carabiners, including oval, D-style, triangle and side gate opening. If you are looking to position the extra large or ladder carabiners, then we have the answer. The 500 series comes with four options for attaching the SureClip to a variety of telescoping poles. Model 300 & 305 — As shown on the left have a 5/16-inch threaded hole at the bottom of the clip. 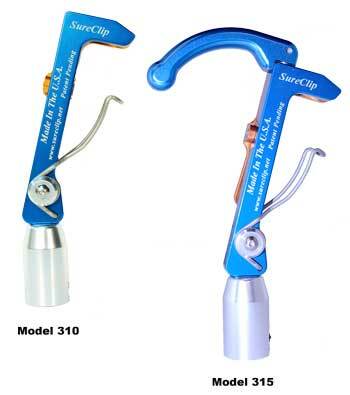 This will allow rescue professionals to purchase a pole of their choice and adapt to the SureClip by simply threading the clip to their existing pole. With a special order it is also possible to increase the threaded hole diameter to 3/8″. Model 500 & 505 – These models are exactly the same as the original SureClip model 300 & 305 and have a 5/16-inch threaded hole at the bottom. The only difference is that they hold the Extra Large carabiners. Model 310 & 315 — These models come with an adapter that threads on to the bottom of the SureClip. We call this the painters pole adapter, it attaches to any pole purchased at Home Depot, Lowes etc. The inside of the adapter has been cut with a 3/4-inch standard thread 1-inch long and has a set screw that will keep the SureClip secure to the pole. This combination of SureClip and adapter allow you to attach it to your choice of poles that can be purchased from the local hardware store. Model 510 & 515 – These two models are exactly the same as the original SureClip model 310 & 315 and come complete with an adapter to attach to any 3/4-inch threaded painters pole. The only difference is that they hold he Extra Large carabiners. Model 320 & 325 — These models come with an adapter that threads on to the bottom of the SureClip, it looks exactly the same as the Model 310 & 315 adapter shown above. The inside of the adapter has been cut to a smooth bore non-threaded diameter of 3/4-inch and is 1-inch long. There are a number of telescoping pole manufactures that provide poles with the 3/4″ diameter end, allowing you to purchase a pole of your choice. Model 520 & 525 – These two models are exactly the same as the original SureClip 320 & 325 and come complete with an adapter to attach to any 3/4-inch telescoping pole. The only difference is that they hold the Extra Large carabiners. Model 530 & 535 – These models are exactly the same as SureClip model 330 & 335 and come complete with a universal adapter to attach to any of the Hasting Telescoping poles listed below. The only difference is that they hold the Extra Large carabiners. What makes SureClip the best non committal rescue tool that you can find?